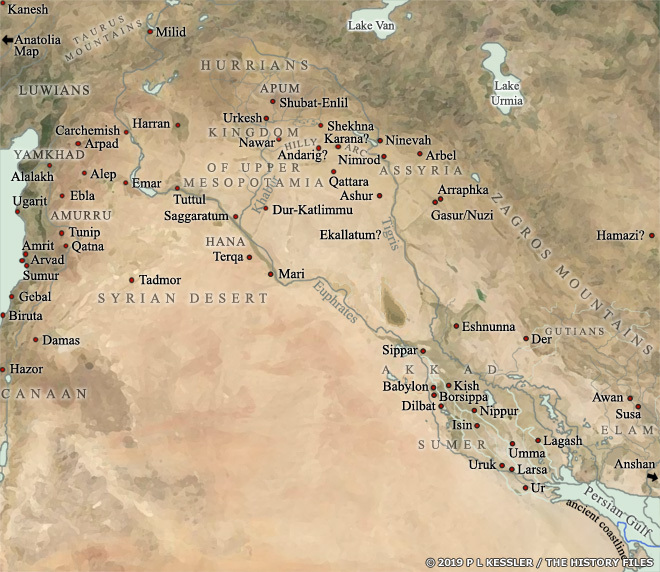 A general map of Mesopotamia and its neighbouring territories which roughly covers the period from 2000-1600 BC reveals the concentration of city states in Sumer, in the south. This is where the first true city states arose, although the cities of northern Mesopotamia and Syria were roughly contemporaneous. However, the latter remained relatively minor states with a less intensive level of development until the collapse of Sumerian civilisation. In the ensuing power vacuum, cities such as Ashur (one of the three main Assyrian cities), and Ebla and Babylon (both Amorite cities) quickly grew in wealth and strength. Shubat-Enlil, in the Khabur river valley in northern Mesopotamia was the rapidly developed capital of Shamshi-Adad's kingdom of Upper Mesopotamia in the nineteenth century BC. 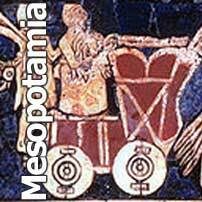 Before that it had been a Halaf culture town and the capital of a minor state called Apum. To select a city or state for further information, click on its name.